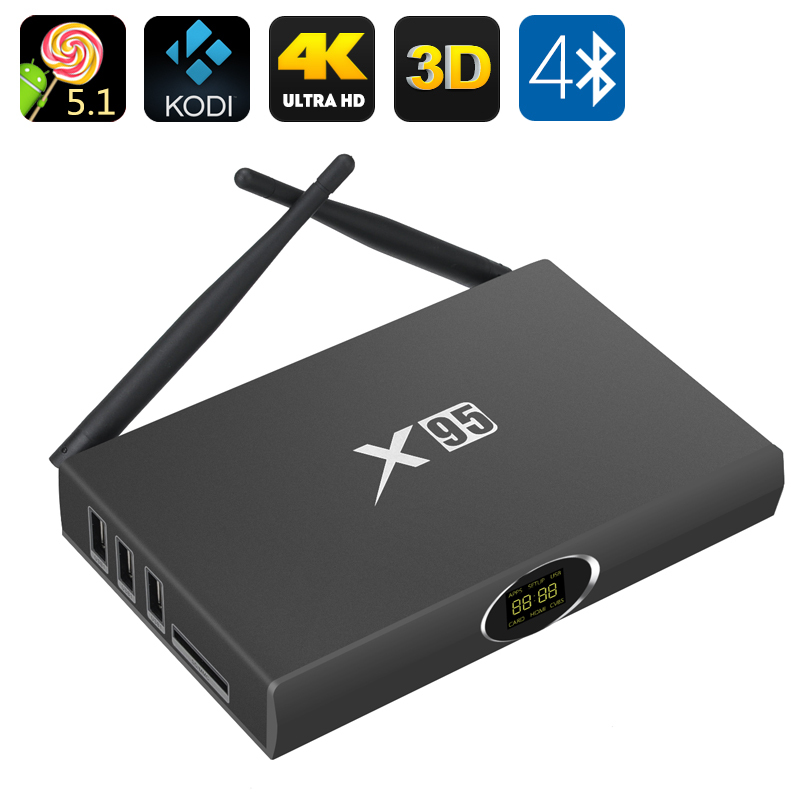 Successfully Added OTT TV X95 Android TV Box - Android 5.1, Quad Core, 4K, 3D, Kodi 15.2, Bluetooth 4.0 to your Shopping Cart. Watch your TV get instantly smart with the OTT TV X95 Android TV Box – a powerful device with a quad core processor, Android 5.1, 4K decoding and great connectivity. Upgrade your home entertainment with unlimited access to great media content and a way to watch it all anytime you want in 4K. The OTT TV X95 Android TV Box comes with 4K decoding and output as well as the optical SPDIF port for enhancing your audio experience. It also features 3D support. The TV box runs Android 5.1 operating system – a great intuitive interface for getting the most out of your TV. Navigation will be super easy and you will have all the necessary tools for managing your fun. The TV box also comes with pre-installed Kodi 15.2 – an open source media player with lots of free media content. The quad core processor will let you multitask, speed through navigation and more. With great connectivity, you can easily connect your TV box to other devices via Bluetooth or Wi-Fi. The TV box comes with HDMI 2.0, 3 USB ports a SD card slot and more. You will have 8GB of internal memory and up to 64GB support on an SD card. The OTT TV X95 features a nice compact design, two antennas and comes with a handy remote for controlling your playback. So, whether you are in it for fun, work, enhancing your TV features or the benefits of having Android on a large screen, the OTT TV X95 does it all. The OTT TV X95 Android TV Box comes with a 12 months warranty. Brought to you by the leader in electronic devices as well as wholesale Android TV boxes..